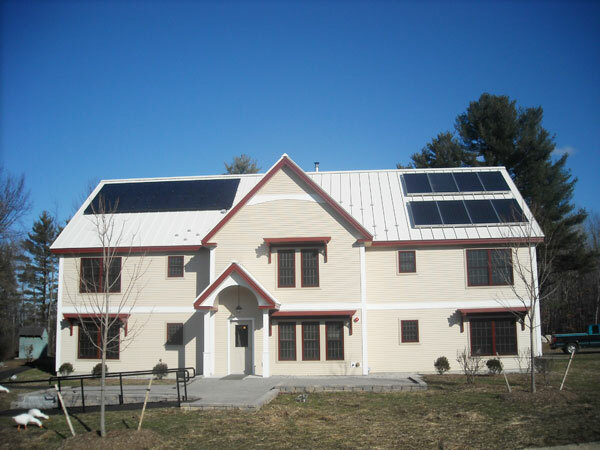 ReVision Energy recently completed an installation of solar hot water collectors, solar power, and a wood boiler at the York County Shelters in Alfred, Maine. The York County Shelters is a living facility for the homeless and for low income residents. This new construction is the first of its kind for homeless shelters in Maine to integrate the cost of renewable energy systems into its building designs. The additional upfront costs are justified as these systems will offer long term savings on their energy usage. The goals of the shelter are to keep people in housing longer by reducing their long term energy spending. They also wish to help reduce the state’s dependency on fossil fuel usage. The York County Shelter is utilizing a high efficiency gasification wood boiler with thermal storage tank, solar hot water collectors, and a 4kW solar electric system to provide most of the heat and hot water for this facility and approximately half of its electrical consumption.